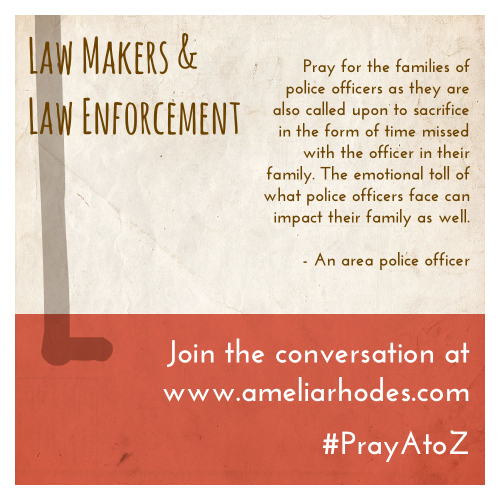 We continue our Pray A to Z series today, and L is for Law Makers and Law Enforcement. You can get caught up on the entire series here. If you haven’t downloaded your free, printable prayer cards, you may get those here. Today’s post is a bit unique. I’m honored to have an area police officer share his thoughts on how we can pray for our law enforcement. Because of the nature of his work, he has chosen to contribute anonymously. Please leave comments on this post to thank him for his service and the sacrifices he and his family make. He won’t respond, but he will see them. If you know a police officer, be sure to thank him or her for their work. As you will read below, they face countless challenges every day. I am a sinner whom God, in His infinite mercy, has chosen to save from a life of sin and selfishness destine for eternal destruction. By God’s grace, my life is dedicated to serving Him and reflecting thankfulness for the new Life that He has given me. I am a husband to my wife of 11 years, a father to our toddling daughter, and I serve as a deacon in our church. I have been a police officer for a little over 16 years and have served a number of roles within that capacity: 911 dispatcher, patrol officer, detective, trainer, supervisor, honor guard member, and crisis negotiator. With this as my background, I would like to share some of the challenges that are faced by law enforcement and some prayer requests related to the police in particular and the Criminal Justice System as a whole. Ever since the police academy, I was told that being a police officer is not something that you do, but is something that you ARE. In one sense this is true because of the dedication required for this career. In another sense as Christians in law enforcement (or any career for that matter) we need to remember that our identity is first and foremost tied to Christ. This does not minimize the role we play in our calling, but should strengthen our commitment to our duty to “defend the poor and fatherless; do justice to the afflicted and needy. Deliver the poor and needy: rid them out of the hand of the wicked.” (Psalm 82:3-4 KJV). The wolves obviously do not like sheepdogs, because by definition they are at odds and it is the sheepdog’s job to keep them away from the sheep. Many sheep do not like sheepdogs (at least until the wolf shows up), because we remind them of the wolf. Sheepdogs have sharp fangs and sometimes show the capacity for violence. Sheepdogs sometimes even have to nip at the sheep’s hind-quarters in order to keep them in line (think traffic tickets). The wolves desire to feed on the flock at any cost, and it is dangerous for the sheepdog to keep them at bay. Pray for safety for the approximately 900,000 law enforcement officers serving in the United States (local, state, and federal). It is a dangerous profession with an average of 150 officers losing their life each year over the last 10 years. That means one officer every 58 hours (source: http://www.nleomf.org). Pray for emotional protection for officers as they often must face grizzly and disturbing scenes. This, as well as the day-to-day stresses of the job, has translated to high rates of divorce, depression, substance abuse, and suicide among officers. Pray for the families of police officers as they are also called upon to sacrifice in the form of time missed with the officer in their family (weekends, holidays, birthdays, etc.). The emotional toll of what police officers face can impact their family as well. Pray for Christians in this profession; that they may maintain their identity in Christ first of all and that they may serve well as ambassadors for the kingdom of God. Pray that, as our country seems to be departing from the principles of God’s Word, police officers will not be asked to compromise their beliefs as they carry out their civil duties. As we #PrayAtoZ L is for Law Enforcement. These are great requests, especially emotional protection for officers and families. Thank you for all you do.